Sometimes small spaces can pose the biggest design challenges. This powder room is on a terrace level that services a theater room, a bar, a pool table, and also provides access to the pool outside. In essence, it is amidst “party central,” but needed to follow the elegant design aesthetics throughout the rest of the home. 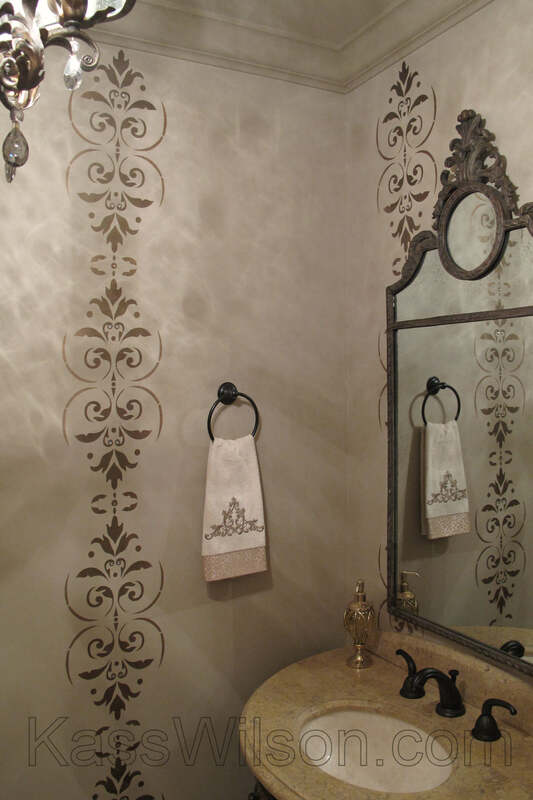 Due to the activities that take place in this area, interior designer Laura Bloom of Home Expressions Interiors requested a decorative finish for the walls that would be both durable and easy to repair. The unusual shape of this room meant that emphasis had to be placed on the height of the ceiling and the furnishings rather than across the walls. 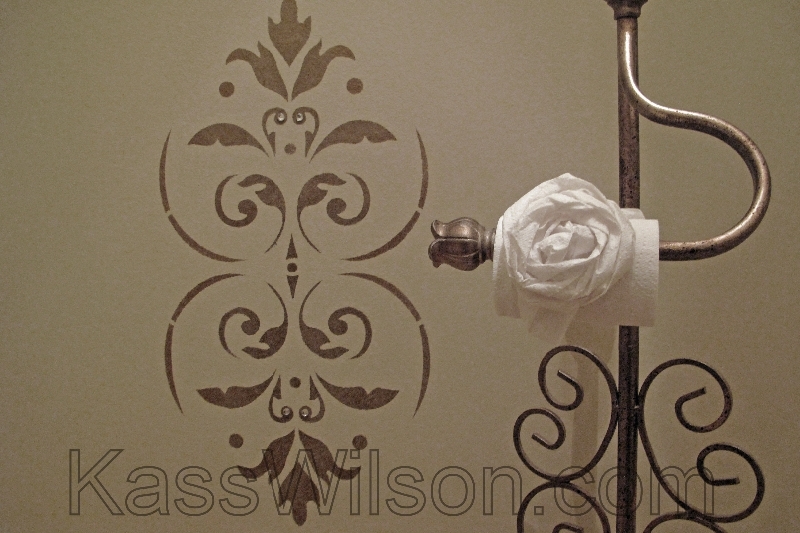 A stencil design was selected that would complement the curves of the other elements in the space. The pattern was adapted to appear as delicate stripes in a graceful pattern. 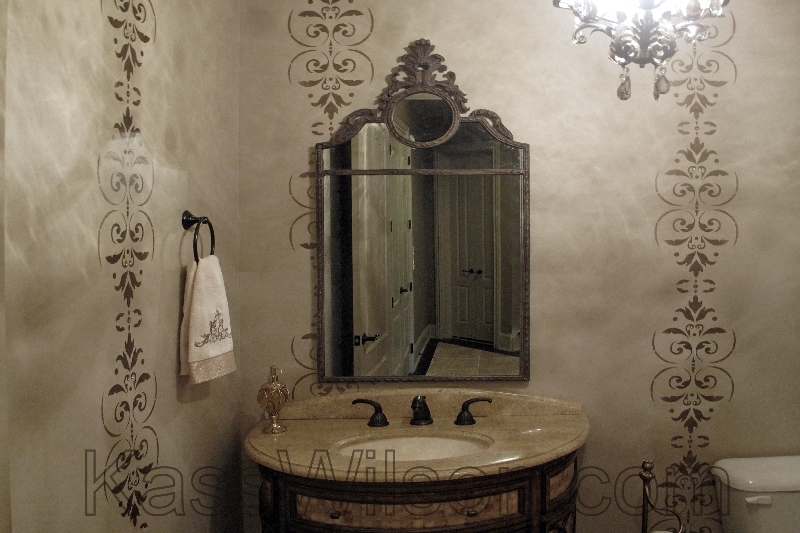 Each fine line of the stencil design was strategically spaced to create the illusion of balance– even when viewing it in the mirror. 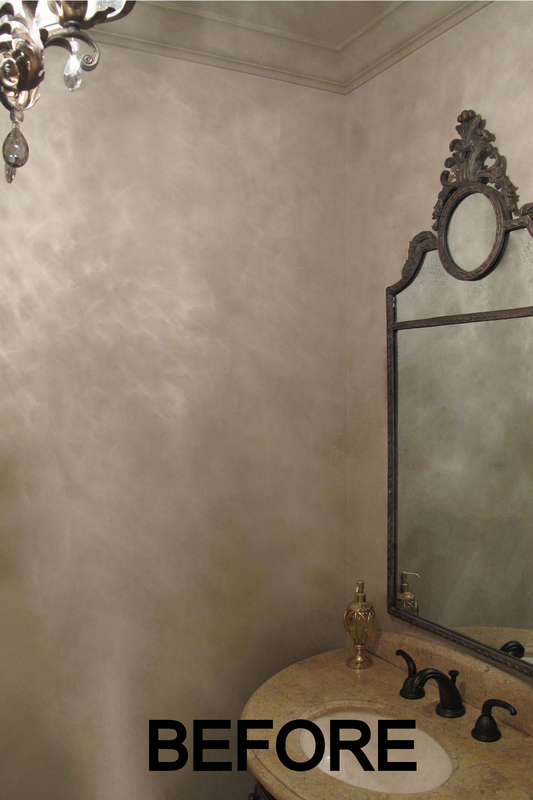 The light fixture casts magical shadows across the walls, eliminating the need for an artistic finish. To emphasize the glamorous style of the room, crystals were embedded for added BLING. 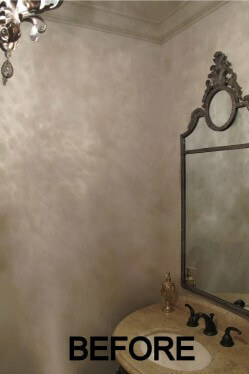 This simple but elegant decorative finish was like the perfect sprinkle of “sugar on top” to dress up this powder room. 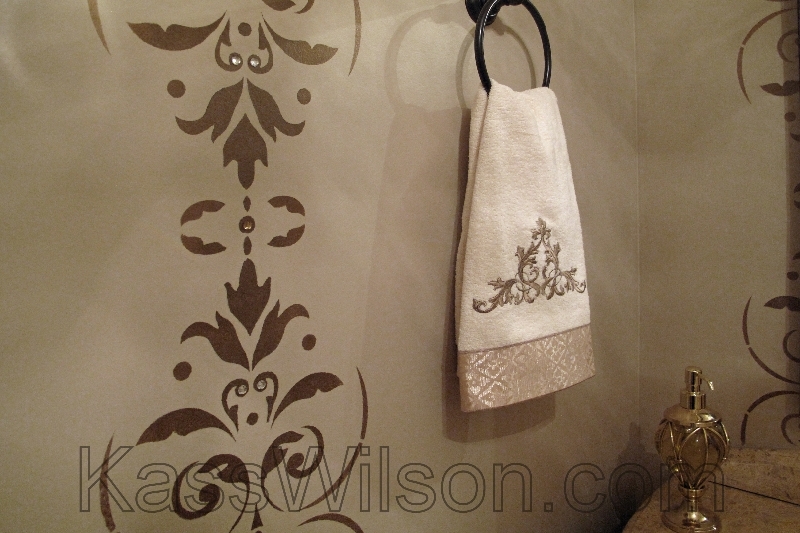 Special thanks to interior designer Laura Bloom of Home Expressions Interiors. 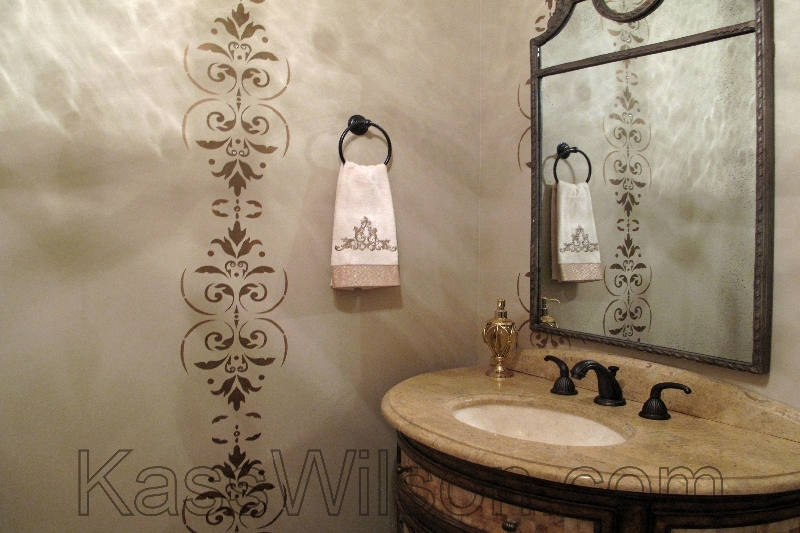 The stencil pattern is by Wallovers. 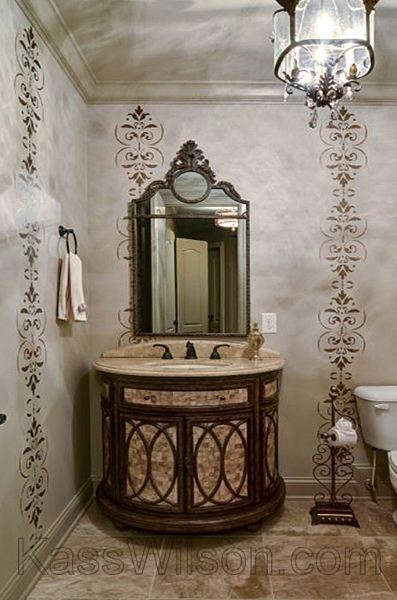 What do you think of this decorative painting makeover? We’d love to hear from you, so please leave a comment below! Another beautiful work of art by Kass!